Kit Car Links is a directory of links to kit car websites worldwide. New link to Nubodi Automotive - the company sells kits from the Tribute Automotive range. Donors are BMW Z3 vehicles which are used as a base to make vehicles inspired by Ferrari coupes and convertibles and also the Kobra - which takes its design cues, without being a replica of, the Cobra. See the listing with all the other UK made kit car makers and suppliers here. 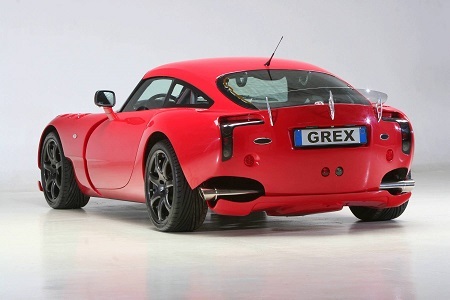 The TVR Sagaris has been recreated as a kit car - the Sagaris GT (above) by Grex Automotive. We've got a link to the company - which is based in Tenerife in the Canary Islands - here. CCK Kempten is a business that can help German kit car enthusiasts import kit and specialist cars in to the country. The firm's website has advice and pictures of owners and their kit cars that have successfully gone through tests and paperwork required to put a car on the road in Germany. See the link in the listing for European dealers, agents and build-up firms here. 427 Hardtop is a hard top for Dax 427 and other Cobra replicas. This UK company has details of the product on its website. It includes a five piece tinted window set and window security locks. See the listing and other UK parts and accessories suppliers here. The Stylus features on the SSC Stylus web page - which has details about this classically designed sports car, formerly the Sylva Stylus. See the link and all the UK kit car manufacturer websites here. In the kit car business? Advertise on Kit Car Links!